1607 - Jamestown is settled as an English colony. 1608 - Protestant Union founded in Auhausen. 1610 - Assassination of Henri IV of France, bringing Louis XIII to the throne. 1643 - Four-year-old Louis XIV becomes King of France upon the death of his father, Louis XIII. 1787 - In Philadelphia, delegates begin to meet to write a new Constitution for the United States. 1863 - American Civil War: Battle of Jackson. 1868 - Japanese Boshin War: End of the Battle of Utsunomiya Castle, former Shogunate forces withdraw northward to Aizu by way of Nikkō. 1927 - University of Chicago's local collegiate organization, Phi Sigma, becomes incorporated under the laws of the State of Illinois as Eta Sigma Phi, the National Honorary Classical Fraternity. 1931 - Ådalen shootings, five people are killed in Ådalen, Sweden, as soldiers open fire on an unarmed trade union demonstration. 1935 - Northamptonshire County Cricket Club gains (over Somerset at Taunton by 48 runs) what proved to be their last victory for 99 matches, easily a record in the County Championship. Their next Championship win was not until 29 May, 1939. 1939 - Lina Medina becomes the world's youngest confirmed mother in medical history at the age of five. 1943 - Sinking of the Australian Hospital Ship Centaur off the coast of Queensland, by a Japanese submarine. 1948 - Israel declared to be an independent state and a provisional government is established. Immediately after the declaration, Israel was attacked by the neighboring Arab states. 1955 - Cold War: Eight communist bloc countries, including the Soviet Union, sign a mutual defence treaty called the Warsaw Pact. 1961 - American civil rights movement: Freedom Riders bus is fire-bombed near Anniston, and the civil rights protestors are beaten by an angry mob. 1961 - Stirling Moss wins the 1961 Monaco Grand Prix. 1970 - Mississippi state police kill two black students at Jackson State University. 1973 - Human Space Flight: Skylab, the United States' first space station, is launched. It is the last launch of the Saturn V rocket. 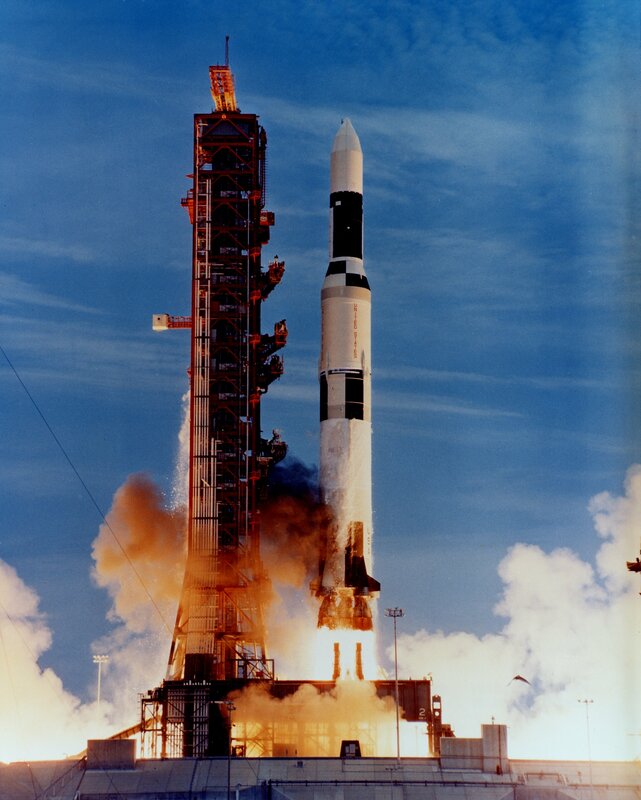 Launch of the Saturn INT-21, carrying the Skylab space station. 1978 - First round of the presidential elections in Upper Volta. 1988 - Carrollton bus disaster: A drunk driver going the wrong way on Interstate 71 near Carrollton, USA hits a converted school bus carrying a church youth group. The crash and ensuing fire kill 27. 1995 - Tenzin Gyatso, the 14th Dalai Lama, proclaims six-year-old Gedhun Choekyi Nyima as the eleventh reincarnation of the Panchen Lama. 2002 - Ten members of the Darwin-based Network Against Prohibition invade the Legislative Assembly of the Northern Territory of Australia. 2004 - The Constitutional Court of South Korea overturns the impeachment of President Roh Moo-hyun. 2004 - The marriage of Frederik and Mary Donaldson takes place in Copenhagen. 2005 - Pope Benedict XVI observes his first beatification, elevating Blessed Marianne of Molokai on the road to canonization into sainthood. 2005 - Ex-America (CV-66), a decommissioned supercarrier of the United States Navy, is deliberately sunk in the Atlantic Ocean after four weeks of live-fire exercises. She is the largest ship ever to be disposed of as a target in a military exercise. This page uses content from the English language Wikipedia. The original content was at May 14. The list of authors can be seen in the page history. As with this Familypedia wiki, the content of Wikipedia is available under the Creative Commons License.